Lyn Pearson, Head of Marketing at Lion Quays Waterside Resort welcomes the showME initiative. Lyn Pearson, Head of Marketing at Lion Quays Waterside Resort, Oswestry, has pledged her support of the new showME Programme launched today by The Jools Payne Partnership. The showME Programme is designed to open the door to employment for all job seekers and young people exiting education through professional training and 1-2-1 mentoring in employability skills. 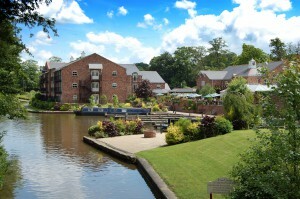 Lyn Pearson said: “Shropshire Leisure Group Ltd is one of the largest employers in the Oswestry area with over 300 employees across our sites at Lion Quays Resort and Moreton Park Complex. Finding good quality candidates is challenging for many businesses, and sadly it’s especially true of young people. Failure to demonstrate their eagerness to develop new skills or even show up with the right attitude for the job can be a real challenge. “All too often we’re rejecting work experience candidates or job seekers at the earliest stage due to rudimentary spelling and grammar mistakes on their CV, a poorly constructed covering letter, or even the lack of basic good manners in their initial approach. “These are fundamental issues that the showME Programme will tackle, backed by the solid business nous of the Programme founders that is sometimes lacking in the education sector. Business knows best what business wants. That’s what sets the showME Programme apart. The first showME Employability workshop will be held on Tuesday 22nd January 2013 at Oswestry Cricket Club, Morda Road, Oswestry. Registration takes place at 08:30 with the course concluding at 1 pm. The showME Employability course costs £35 + VAT. Reservations must be made in advance as there will be no admissions on the day. To reserve your place call Ian Payne 01691 712755 or contact Ian through the Contact page on the website for more information and course details. Places are strictly limited to 20 people.